LASCO 13-1257 2 Bolt Metal Hinged Type Pipe Repair Clamp with Bolts, 1 1/4-Inch by LASCO at Tizimi Press. Hurry! Limited time offer. Offer valid only while supplies last. LASCO 13-1257 Pipe Repair Clamp With Bolts, 1 1/4-Inch Pipe Size, Metal Hinged Type, 2 Bolt. 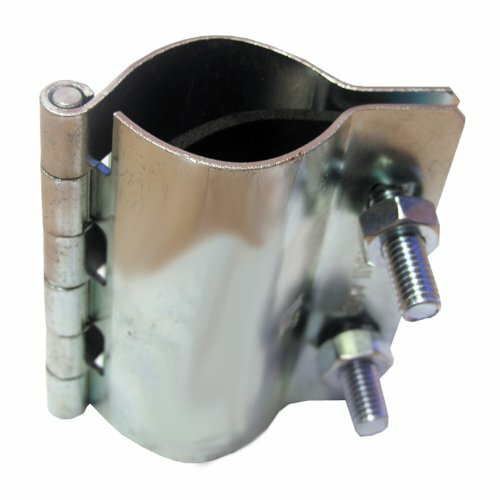 1 1/4-Inch IPS 2 bolt hinged type pipe repair clamp. LASCO 13-1257 Pipe Repair Clamp With Bolts, 1 1/4-Inch Pipe Size, Metal Hinged Type, 2 Bolt. 1 1/4-Inch IPS 2 bolt hinged type pipe repair clamp. Heavy gauge galvanized steel body with rubber gasket. Provides a positive seal on leaking pipes. 3-Inch in length. Quick easy to use. 3-Inch in length.